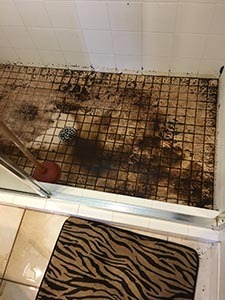 Sewer Blockage Causing Your Shower to Backup? Did you wake up to a beautiful fall morning and find your shower full of black, ugly looking water? Did you flush your toilet only to see it didn’t flush? If your toilet is stopped up and your shower is backing up also, you have a clogged drain. Somewhere in your main line there is something causing a sewer blockage. Plumbers in Sarasota, Florida, call it a stoppage. If you have a home built before the 1980’s, in Sarasota or Bradenton, your Plumber can be sure that you have a cast iron drainage system under the floors of your home. Cast iron piping causes a lot of drain lines to stop up. The reason, is that over time, cast iron pipe deteriorates, by rusting out. This leaves behind rust, scale, sediment and ledging in the pipe that will catch paper causing the sewer line to stop up. As the cast iron pipe gets choked off by all this rusting and ledging, it slowly reduces the inside diameter of the sewer line. So instead of being 4″ in diameter as most residential waste lines are, it sometimes gets closed off completely. This causes your clogged drain. Cast iron piping will generally last 40-50 years before causing clogged drains. 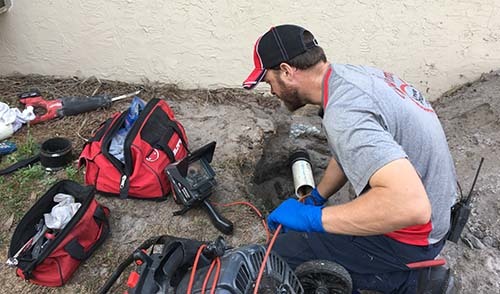 Professional and reputable Plumbers, such as Wimpy’s Dependable Plumbing have sewer cameras on all of their plumbing trucks to aid in locating and finding the cause of your clogged drain. They can see with their sewer camera exactly what is causing the problem and where it is. This enables them to give you the best option to fix your drain problem so you can flush with peace of mind. When your cast iron drain lines start stopping up on you and causing your toilets to back up, there are several ways to get a permanent solution. Just cabling out, or as some plumbers in Sarasota call it, rodding out your drain, will only last a short time. Wimpy’s has all of the proper tools and equipment, such as hydrojetters, Picote High Speed Milling Machines and Permaliner cured in place piping, also known as CIPP. If you have original Terrazzo floors or freshly laid, wood or marble floors that you don’t want to disturb, we can rehabilitate your pipes without disturbing your floors. With that being said, there is no substitute for all new pipe. However, all new pipe involves more time and cutting up your floors. Plus the cost to repour concrete, lay new flooring and possibly installing new cabinets. Rest assured, the Plumbing Professionals at Wimpy’s can offer you the best solution, based on your needs and budget. Our highly skilled Plumbers will always treat your home with great respect. Making your pipes new again, takes a great amount of skill and attention to detail. According to all of our customers, we do this quite well. Call 941-322-1911 to schedule service.